Overview. 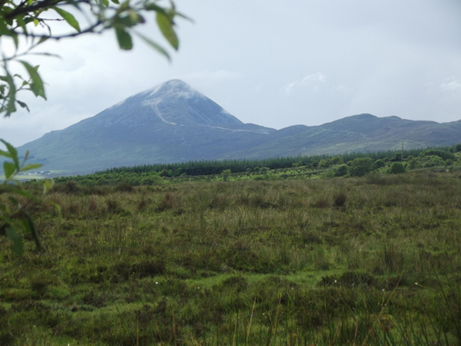 The Tóchar follows the route of the ancient royal road from Cruachán, the seat of the Kings of Connaught, to Croagh Patrick. Holding many resonances from its pagan past; it was Christianised as a penitential route by St Patrick, but remains stubbornly untamed and much as it was for medieval pilgrims. The route is well way-marked with the distinctive Tochar logo. Grade. Moderately difficult pilgrim route with some tough, demanding underfoot conditions in places. Altitude rises to almost 500m on Croagh Patrick. Raingear, trekking boots, warm clothing are essential. Time. At least 10 hours. Can be completed in 1 challenging or 2 more leisurely days. Trailhead. Ballintubber Abbey is located just off the N84, about 14 km from Castlebar. Here you must register as a Tóchar pilgrim before setting out. This costs €10. Passport Information: 094 903 0934, email: info@ballintubberabbey.ie. Passport Stamping Point: Ballintubber Abbey & Campbell’s Pub, Murrisk. Map and guidebook available from Ballintubber Abbey.